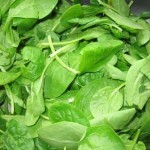 Spinach is in season in spring/early summer, although frozen spinach is available all year round. Baby spinach leaves have a milder flavour than the fully mature plant, and are perfect raw in salads/sandwiches. Fresh spinach can be added to a wide variety of dishes right at the end so the leaves simply ‘wilt’. 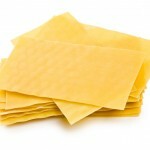 Also a great addition to creamy/egg/cheese dishes such as vegetarian lasagne. Follow a recipe; follow food safety & hygiene rules; tidy away; use measuring spoons and cups; use balance/digital scales; chop using bridge/claw technique; use a box grater safely; crush garlic; beat ingredients together. Sharp knife, chopping board, large pan, wooden spoon, mixing bowl, blender, ovenproof dish, hob, oven. Make tomato sauce: place oil, onion and garlic in the pan and heat gently on the hob until softened; add the tomatoes, tomato puree and herbs and simmer (uncovered) for about 10 minutes. Meanwhile put the soft cheese in a mixing bowl and beat until smooth. Add the spinach and mix well. 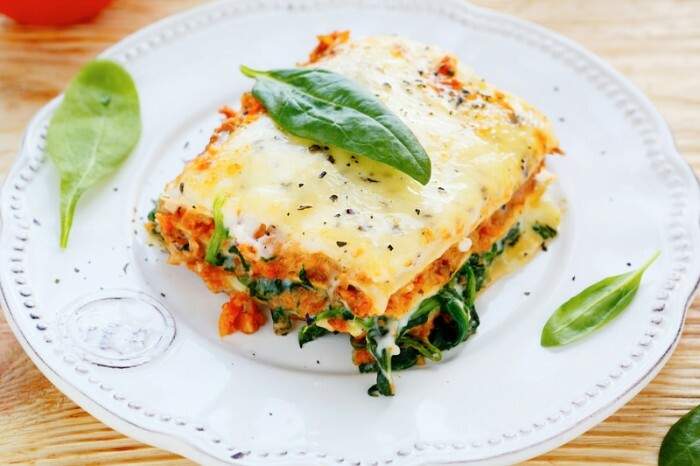 Spread a thin layer (around one third) of the tomato sauce in an ovenproof dish, then half the spinach mix. Cover with 4 sheets of lasagne. Repeat the layers, then finish with the remaining tomato sauce. Sprinkle with the grated cheese, and bake in the oven for around 30 minutes until bubbling and golden. Lasagne is a type of pasta. Pasta is a useful source of protein, B vitamins and fibre, and is low in fat and salt. Beware high-fat sauces and choose wholemeal varieties. Spinach and Tomatoes are both rich sources of a variety of vitamins and minerals, as well as antioxidants and bioflavonoids which can help protect our bodies from disease.